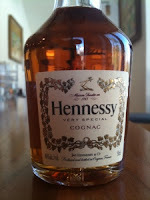 I sure do enjoy a nice Cognac from time to time. Cognac is a grape brandy made in the controlled region of that name a bit north of the famous Bordeaux wine region in France's central west coastal region. They make a thin light white wine, distill it twice in special "alembic" stills and then age the distillate in French oak casks in carefully atmospherically managed caves. The better cognacs are bursting with citrus and vinous fruits, densely floral, syrupy rich in texture and redolent of nuts, leather, sandalwood and oak. Some of the cheaper ones are afflicted with a turpentine-like burn. Cognac comes in, broadly, three main varieties VS (aged at least 2 years in cask), VSOP (aged at least 4 years), and XO (aged at least 6 years - but typically far older). Another major variation is the region of grape production. 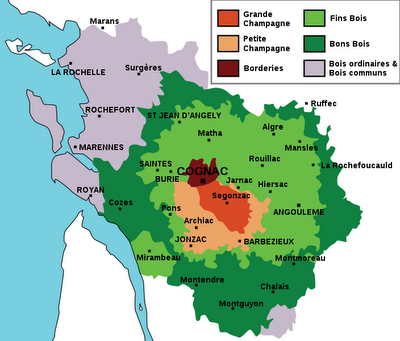 Grand Champagne and Petit Champaign are in the heart of the region - adjacent to the town of Cognac, with the best soil which is chalky. Grand Champagne's soil is less compacted than Petit's. Borderies is just to the North and is a clay and flint plateau. Fins Bois is a wider ring around these three. It has a different kind of soil - red clay and limestone. Bons Bois is a wider ring going out to the limits of the controlled region with similar soil to Bons Bois - but more sand in it. There is a western maritime zone further out called Bois ordinair where the soil is primarily sandy. 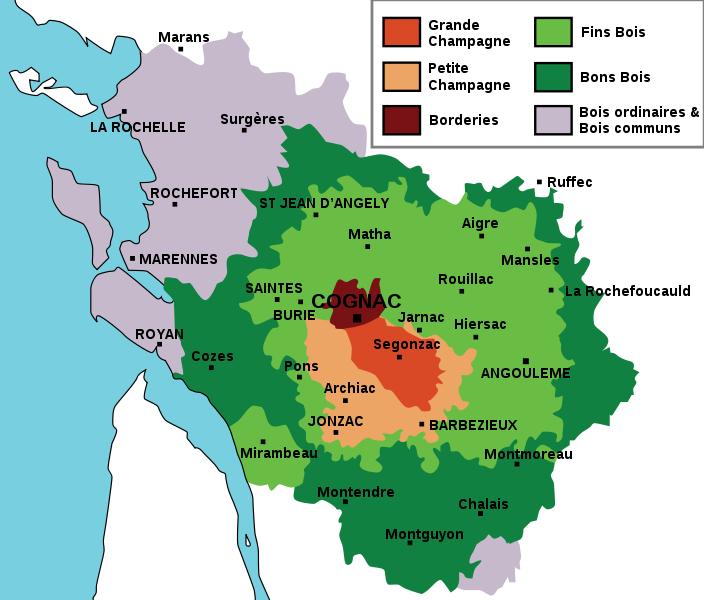 I've yet to see a cognac that mentions that region by name. Supposedly the quality of the grapes is better in the chalky Champagne Crus - although opinion is not unanimous. FYI - the word "Champagne" here has nothing to do with the Champagne region of the North of France where the bubbly wine comes from - it's just a word for "countryside" in Latin. Cognac runs a color gamut from marigold yellow through orangey copper on to amber and then all the way to hazelnut shell brown. These color variations roughly correspond to age with VS tending to be in the yellow to light orange range, VSOP tending to be in the dark orange to amber range, and XO tending to be in the amber to reddish brown range. Most cognacs have a much narrower range of variation in flavor profile than scotch does (although the wider world of brandies has considerably more variation than you'll find in Cognac alone - including some lovely leather and fig Spanish, refined sweet South African, and very distinctive Armenian ones). However the sweep of variation from bad cognac to really nice cognac is breathtaking. So, sadly, is the hype and marketing goo goo. Ranging from pseudo-imperial French pretension with a predilection for insanely expensive bottle materials (i.e. gold, platinum, uber crystal etc...) to a weird contemporary hip-hop connection, the way Cognac is sold can be stomach turning in my opinion. Nevertheless, the issue is, as always, what's in the glass when the gauzy models, leather clad rappers, and fancy packaging are left behind and out of mind. Nose: Marmelade, honey, some light sandalwood - pretty weak. Mouthfeel is very light. Entry is sweet with vanilla and a vinous simple sugar note with a prominent sawdust wood note with an incense perfume aspect (patchouli). Midpalate expansion is mainly a mild spirit heat. There's not much depth here. Finish is very short, mainly spirit heat - but also some wood in the fade-out. It doesn't suffer from the turpentine burn of bad brandy - that's the upside; just from a lack of depth of flavor. Color: orangey amber - also lacks a Cru region statement. Nose: Light sandalwood / patchouli incense perfume is the dominant lead off note. Slight citrus note, but not much else past all the incense. Like the Courvoisier VS, entry is sweet and light - dominated by a sweet simple sugar vinous note and a burst of fresh sawn wood with a patchouli incense flavor. Spirit heat is even more present here than with the Couvoisier VS in the midrange. This stuff is hot. There's a little hint of the turpentine notes. Ironically, the finish is a little longer with some nice almond notes, less bitterness than the Courvoisier VS in the finish, and some nice oak. Nose: nice jammy orange, honey, dates, prunes, figs, and black currants initially. There's a little oak wood sandalwood perfume. Noticeably absent are floral notes. With time, the intensity of the nose fades, unfortunately. Still, what lingers is pleasant. I could nose this for a while. Entry is vinously sweet, spicy and a bit woody. Midpalate broadens into tasty sherry notes, vanilla floral notes and big oak spice. The finish is medium in length with lovely fading cabernet with some nice grape seed astringency. With extended time the mouth feel becomes a bit thin but the flavor profile is pretty tasty and distinguished. It's not intense - but it presents the clear strong flavors of grape spirit, oak sugars, and oak wood notes. Nose: jammy citrus and candied orange peel. Blackberries, walnuts, red currants. Entry is sweet and a bit spicy. There's vanilla and a nice cognac jam-like citrus and grape rancio taste. Midpalate expansion is hot (a sign of young spirits mixed in). Mouthfeel is light - belying the darker color. Finish is medium short with spirit heat, rather than oak driving. 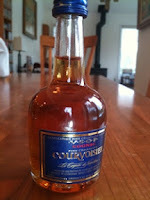 There are some vanilla and oak notes in the finish that are clearly part of the good cognac flavor profile. However there's too much admixing of lower quality spirits here. This is a disappointment. Nose: crystallized orange, faint citrus flowers, cognac spirit, sultanas, distant oak. The best nose of the VSOPs in this segment. Entry is sweet with white raisin grapey syrup. There is glory and rich mouthfeel in the sweet thrill of this opening. Midpalate blooms quickly with jammy citrus notes of orange and lemon, spirit heat as peppery boldness, and also a confectionery candy quality with somewhat faint floral overtones of honeysuckle and jasmine. In the transition to the finish things rapidly darken as floral oak turns to tannin bite. This emerging bitter note meshes well with the crystalized orange as an candy orange rind feeling. Finish is moderately long with a cilantro note in the back of the throat at the fade out and lingering vinous sap. Frapin Chateau Fontpinot XO - all the grapes come from the single plantation at the Chateau Fontpinot in the heart of the Grand Champagne Cru. $105/750ml at Park Ave, $90 on line. Nose: august floral vanilla with a big floral component that includes honeysuckle and some rose notes. Confection in the form of marzipan (candied almond paste), plus darker nuts (walnuts or hazelnuts), and dark caramel. There's a big wood perfume aspect too: oak, and sandalwood. This is a rich and luscious nose that you can bury yourself in for literally hours. Entry is rich with dark burgundy, quince, black figs, and plum/prune flavors, The midrange expansion brings in tobacco, walnut skin, and sandalwood perfume. The finish is long and dominated by vanilla, sandalwood oak perfume, and rancio (grape noble rot with cheese-like overtones). It's a rich and heady pudding. 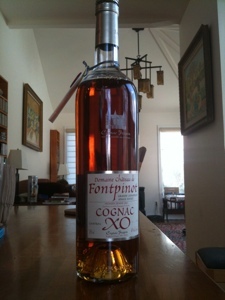 Clearly Frapin Chateau Fontpinot XO needs to be considered among other XOs. The purpose of putting it here was to represent the class and see if it clearly outclasses the other offerings. The answer is yes, indeed - and how. This stuff is a whole different ball game. Entry note is cough syrup. Chemically, medicinal, and gripped by an artificial orangy flavor. This is going right down the drain. So, let's review: the two VS offerings were light, hot, and unbalanced in that they had too much patchouli incense and spirit heat and not enough body, complexity in the sweetness up front or the nose, and enough wood in the finish. They weren't undrinkable; but I'm not going to seek VSes out. At $30-35 they don't compete with bourbons or even Scotch in this price range. In the VSOPs things are different. 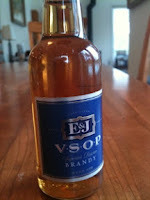 There are VSOPs that satisfy and compete successfully with bourbons and Scotches of comparable price. 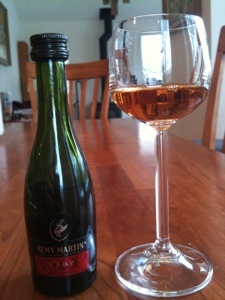 Remy is less floral and citrusy than the Frapin VSOP, but doesn't strike any off notes. Given that Remy VSOP goes for $40 around here and Frapin VSOP goes for over $60, that's fine. 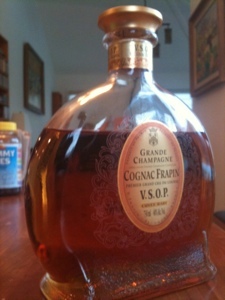 The Frapin VSOP is close to entry level XOs in quality and price - and is more a transitional form between VSOP and XO. Part of its expense is that it is composed solely of Grand Champagne grapes. Frapin VSOP was the best of the VSOPs in this test, but Remy VSOP isn't embarrassed by the the Frapin VSOP at only 2/3rds the price. Furthermore, Remy VSOP has superior mouth feel, flavor density, and balance to Couvoisier VSOP which is very close to the same price. The less said about E&J "VSOP" brandy the better. The sole XO here, Frapin Chateau Fontpinot, stole the show and is a highlight experience. I'd have to say it represents excellent value at its relatively high price. Spirits that cost in the vicinity of $100 should wow you. This one absolutely does. Bottom line Remy Martin VSOP is very much the winner here in the mid-range price segment. I learned that I like the best quality (surprise, surprise). But for an everyday Cognac, Remy Martin VSOP is like Johnny Walker Black Label - it comes close to a stylistic archetype via extensive blending and achieves that at a very realistic price. Cognac is enjoyable and satisfying when you spend long green to get special examples. 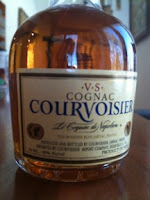 But Cognac is also enjoyable and satisfying at mid-level prices too. Have you ever tried Pisco? Its a grape brandy from South America - the wine growing regions Peru and Chile, specifically - and depending on its country of origin has completely different distilling and aging methods. Very good in mixed drinks and cocktails (such as the Pisco Sour); I've yet to try it straight, but even in mixed drinks you can tell that it has a very different flavour from European brandy and Cognac. I haven't tried Pisco, Dan. But I'll be on the lookout for it. I spent time in Italy and developed a taste for Grappa - which is "new make" grape brandy. My grandfather distilled plum brandy (slivovitz) in his basement - so that's a family tradition. There are excellent brandies from around the world. I have tried (and greatly enjoy) Spanish brandy. My dad keeps a bottle of Cardinal Mendoza with a permanent place in his cabinet. When I get back home I regularly have a visit "with the Cardinal". It's always time well spent - dark and full of leather, tobacco, dark figs and tannins like walnut skins. It's a great brandy to accompany a big stogie. I'm also very very interested in the lively array of South African brandies and Armenian brandies. The Armenians have won a bunch of awards and are reputed to be excellent. Ararat, a brand of the Yerevan company is supposed to be great - and comes in a wide range of expressions. The Ararat 6 year is $21.95 at Shopper's Vineyard. Nairi is another Armenian brand. Nairi 20 year old is $59.95 at Shopper's Vineyard and I've looked longingly at it for a long time. Another superb brandy is Germain Robin from California. They have a range of high end products that are frequently reckoned among the best brandies in the world. Germain-Robin XO is $125 here - and many of their bottlings are incredibly limited, rare, and extremely expensive. Apparently the secret has been out for decades about Germain-Robin. One of the founders is a master distiller from Cognac and they make brandy from the best California grapes using traditional and high end Cognac methods. It's not a surprise that California brandy could rival the best - when done right. Glad to find that blog.It's really good.. I know this is an old review, but I've actually found that I prefer the Paul Masson brandies to E&J if I'm going to go the bottom shelf route. I wondered if you felt the same way. The Masson Grande Amber VSOP is a steal in my opinion, but I can't pretend to have the palate that experienced reviewers like you have, so I may be off in my advice.